What do you do when life doesn't meet your expectations, when things don't fit in with your plans - and there's nothing you can do about the situation? Some people complain, moan, and berate anyone or everyone. Some people recognise it's outside their area of control - and just change their attitude to it. And, encouraged by the media, there’s a lot of complaining going on. It’s just not fair. We wait all year in the hope of two or three warm, dry, and balmy summer months and what happens? Rain, rain, rain! Whatever happened to all this global warning stuff? The children are back at school this week – and what sort of summer did they have, then? That’s the last time I’ll stay on the UK for my summer holidays, I can tell you! It didn’t used to be like this – not back in the old days. Yes, it has been unseasonable weather – wet, cool, and windy at times. And lots of people are complaining about it and bemoaning that summer hasn’t turned out as they’d hoped. Over the past few weeks, especially since the school holidays began, I’ve seen families and groups wandering about on Bournemouth’s beautiful beach and through the lovely gardens – in blustery weather and wearing rain gear over their summer shorts trying to make the best of their seaside holiday in the rain. And what’s been interesting is the different attitudes being displayed. Some rush around with heads down and glum faces. Yet others laugh and joke as they struggle to keep their light rainwear covering them rather than blowing away in the wind. Yet, there doesn’t seem to be a consistency in who enjoys and who endures. It’s not that the young are cheerful while the adults are not. Nor vice versa. And both groupings have the same circumstances – the weather is unseasonable and their expectations of a warm sunny break at the seaside haven’t been met. That said, there does tend to be a consistency within each group – some groups are miserable and some are cheerful. Perhaps it’s the ‘misery is contagious’ versus ‘cheerfulness is catching’ thing and some groups are lucky; they have an influential personality who infects them with a cheery bug whereas others get infected by a misery spreader. This highlights(!) that we can choose how we respond to life’s ‘events’: we can curse the darkness or we can go into active mode and do something about it by lighting a candle. Some of us like a good old moan! When things are not to our liking we whinge and moan and blame. We don’t take action. We don’t light candles! We go into passive and complaining mode. And, since, there’s little satisfaction in moaning alone, we seek out others with whom we can share our misery - and who will support our passive attitude. It’s a useful, if slightly corny, reminder of how attitude works. Two people can look at the same situation and, depending on their habitual attitude, have a quite different response to it. You could say that our attitude is our habitual way of perceiving situations and responding to them. And a negative or pessimistic or fatalistic attitude is just a set of habits that guide how we look at and how we respond to situations. It’s not a deliberate decision or choice. It’s a frame of mind we gradually slip into - unless we’re careful. Some people develop the habit of only seeing the bleak, the negatives, and the problems. Others look for the opportunities or possible benefits or positive aspects of even unwelcome events. Some people develop the habit of complaining about things we don’t like – rather than doing something about them. Others look for ways of changing or improving things – and then roll up their sleeves and move into action mode. And if this doesn’t work they adapt to the unexpected situation. Some people have discovered that finding people who share their negative attitude enables them to feel righteous and justified in complaining rather than acting. Others haven’t the time to do this because they are too busy doing or adapting! What about your own ‘attitude’? Proactive: action oriented and prepared to adapt to the unexpected - if I can’t change things I can always change how they emotionally affect me. Passive: they reject and resent unplanned change – It’s just not right - things shouldn’t be like this – why is this happening to me? Did you recognise your ‘attitude’ or habitual response in these descriptions? Your attitude is not you – it’s not even ‘how you are’. It’s merely a set of thinking habits and emotional habits that you’ve picked up along the way. And if you can ‘pick up’ or develop a habit you can replace it with a new habit. Here’s how to get working on replacing the passive and complaining habitual attitude. Think back over how you’ve handled disappointments, difficulties, and setbacks in the recent past. Do you tend to accept and put up – in other words, do you curse the dark? 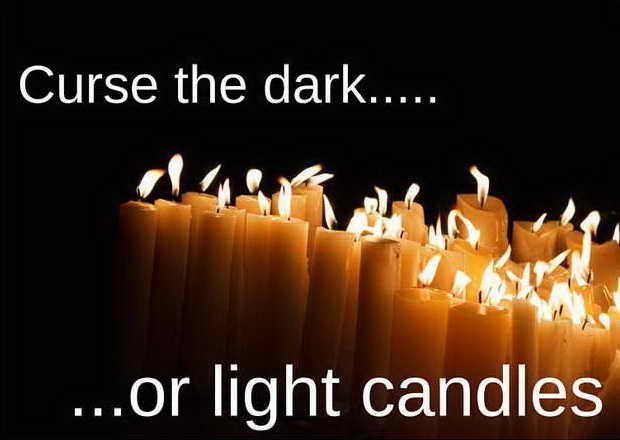 Or do you take action – do you light candles? You don’t need to immediately reject the passive, complaining approach. It has its benefits. You don’t have to actually do anything, for example. You can just lie back and hope things will improve. You also have a way of making friends because you can seek out people who share your passivity and your pessimism. And this is easy because there are a lot more negative thinkers out there than of the other kind! But if this passive approach doesn’t work for you and you’re not prepared to go around complaining then decide that it’s time for a change of attitude. Wait before you change your attitude. Yes, be passive for a little longer! Just observe your passive and complaining and rejecting attitude in action for a few more days. This is to build up your motivation through seeing and feeling what the passive approach is costing you in terms of peace of mind and quality of life. Move to this stage once you feel sufficiently motivated. And if you’ve done a good job with the 'negative motivation' in No. 3 above this is relatively easy. And, if you cannot take action, your back-up plan is to change how you emotionally respond to the situation in a positive and life-enhancing manner. Being proactive and positive may not be enough. In the real world there’s no guarantee that changing your attitude and having a go will always work. Sometimes things don’t work out no matter how proactive and positive you are. It is a very valuable principle to adopt for everyday life. It implies that even when we cannot influence what is happening in the world around us we can always be in charge of how we are emotionally affected by these events. A similar idea is encapsulated in Ghandi’s comment No one can hurt me without my permission.